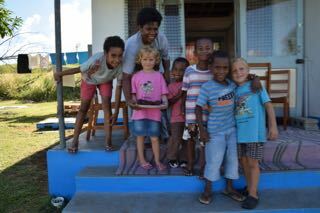 We asked Ben where we could go to church for the Sunday service which is something to experience in Fiji for its warm atmosphere and beautiful singing. 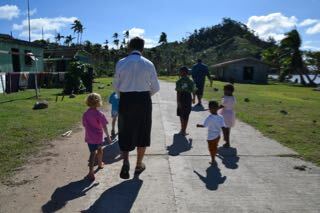 Ben answered that he would be delighted to welcome us to his church in the village of Uruone, a km away from Lomaloma and that we are invited afterwards for lunch at his sister’s house. We were delighted! The day after Ben picked us up the police pick up car by the warf. Guess who were the most proud to sit in the back? 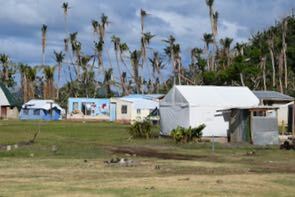 The village of Uruone is now a mix of houses standing still from the cyclone and tents given by the Red Cross. 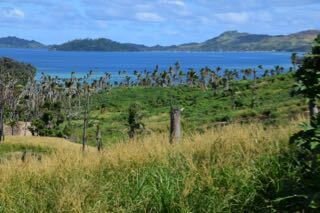 A normal view in all villages of Vanua Balavu. Going to church. 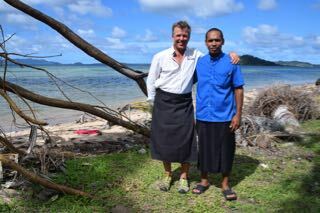 All men are dressed in a skirt, called “Sula". It is always worn at the Sunday service and other special occasions, as the finest dressing they have. Ben borrowed one to Jörgen. Ladies are to wear dresses or at least cover shoulders and down below the knees. The knees are not to be shown. 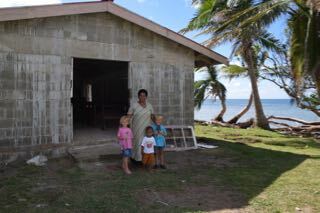 This Sunday service is held in the community hall as the church is blown away. The picture to the left is Ben’s sister Linda with her son and Alex and Inez. 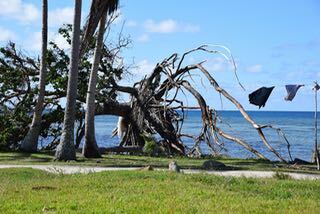 The picture on the right shows how extremely powerful the cyclone was, digging up those huge roots! 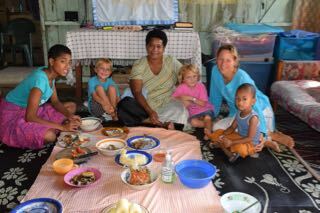 We are kindly invited for lunch at Linda’s house. They served lovely fish in a tomato sauce, kasha (a root, eaten like our potatoes) and onions. A cloth is laid on the floor and lunch is served. Linda is not eating until we have finished. Then she eats what is left. As a gift we had made a strawberry pie with vanilla sauce. That they liked! Alex and Inez gave Linda a picture they had drawn. 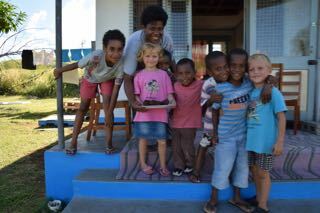 Linda explained that nearly all men had left Lomaloma 3 weeks ago to go to Savusavu. 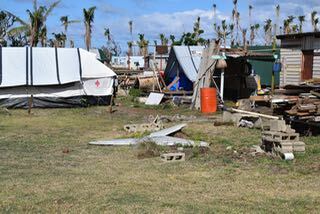 Families had received from the government a credit card with 300 US dollar to spend on buying wood and what is needed to rebuild their houses. Linda’s husband and father were among these men. As Linda’s father is the Chief of the village (they inherit the Chief’s position) she is now the Chief while they are gone. 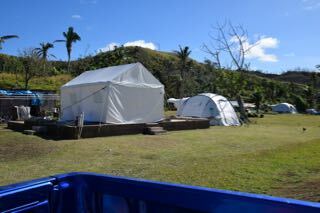 The men are expected to be back in a week’s time when the next ferry goes from Savusavu (they go once a month). Ben did not have lunch with us as he had to go on duty. Inez is eating her lunch with Linda’s son. 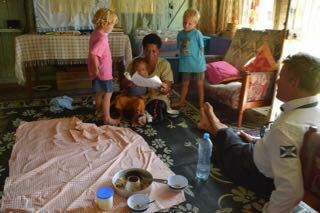 After lunch we were invited to go and play with Lie’s 5 children. Alex and Inez were delighted about this! 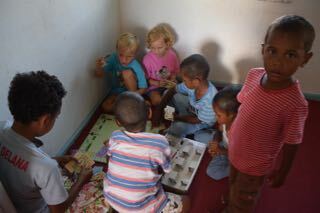 Here they are playing Monopoly! We are sitting on the terrace with Lie and Ben…. …. 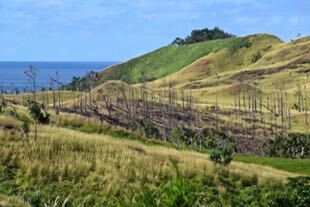 overlooking how nature is recovering from the cyclone. 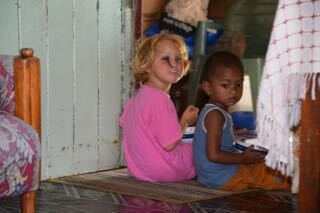 Ben and Lie told us that after the cyclone had hit the island, there was nothing green left. The wind had been blowing up the sea so hard that it was bringing salt crystals. These salt crystals together with the extremely hard wind whipped the nature as if it was burning it. After the cyclone had passed it was like there had been a fire! 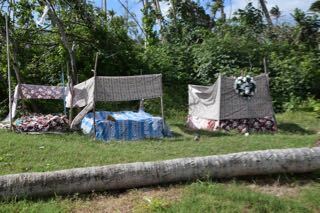 This is now what we see 4 months of after the cyclone. The nature recovering slowly and surely. 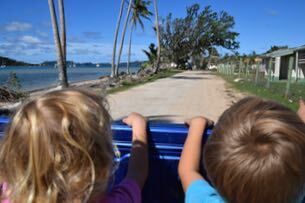 While the kids were playing Ben and Lie drove us to the next village just by the sea. 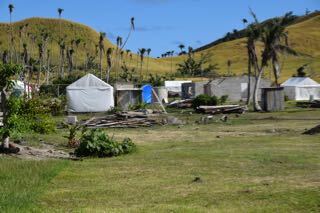 This remote village had no more road access until only a week ago. This village was particularly hit as they had 5 casualties. The picture to the left is where they are buried, just by the village. At some point we had to go back and fetch the kids. They had a great time and Alex found a friend, Josh.